Switzerland 2011. Subtitles, 44 minutes. Directors: Frédéric Choffat, Vincent Lowy. Screened at the Bradford International Film Festival in 2012. 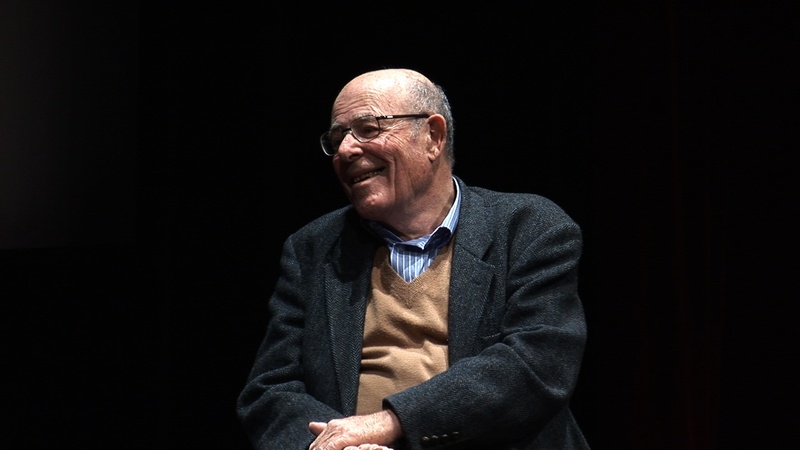 This short documentary records a meeting in 2009 between two of World Cinema’s leading directors: Jean-Luc Godard, the uncompromising, quixotic and modernist director and Marcel Ophüls, a director whose films tease out through a forensic cross-examination the actual events behind a deafening social silence. The conversation seems to have followed a screening of Ophül The Sorrow and the Pity (Le Chagrin et la Pitié, 1969). The is a film that addressed the German Occupation of France in World War II and the collaboration by many French people, including actions against Jewish people. If you have never seen this film it is one of the truly great film documentaries: it meets Andrew Briton’s criteria, ” great documentaries are analytical, in the sense that they present the corner of reality with which they deal not as a truth there to be observed, but as a social and historical reality which can only be understood in the context of the forces and actions that produced it. Secondly, they are engaged, in the sense that they lay no claim to objectivity, but actively present a case through their structure and organisation of point of view.” (Invisible Eye, Sight & Sound February 1992). Part of the fascination of the film is the contrasting styles and ideas of the two protagonists. A contrast that is writ large in their film output. The occasional referee in this debate, Jean-Pierre Rehm, opines that ‘two great filmmakers reveal their faces and their smiles.” The exchanges are courteous and restrained; though at times it appears that there is more substantial disagreements beneath the polite surface. Godard, as one might expect, he being so experienced in argument, starts off. His plays with his famous cigar as he eloquently sets out thoughts on film and filmmakers. Ophüls is much more restrained and tentative: Godard dominates the early exchanges. However, as the discussion develops Ophüls’ subtle, often needling comments, have an effect on Godard. It transpires that some years previously they had discussed a possible film on Palestine and Israel. Here the issues of national, ethnic and cultural difference become important. Ophüls a German Jew, with first hand experience of the European Holocaust, who has lived and worked in France for most of his life. And Godard, Swiss, but again having spent much time and filmmaking in France and who also had experience, different from Ophüls, of World War II. The project for a joint film was never realised, and some of the factors become apparent in this conversation. 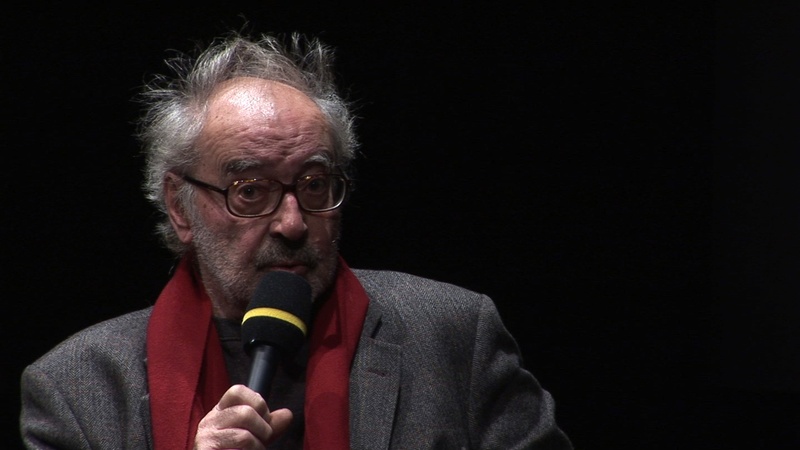 Godard, however, has addressed the subject in his 2011 Film Socialisme. This is a vastly different work from that of Ophüls. With brilliant visual and sound design, it is a film of such complexity that one viewing is clearly insufficient. Yet, like that of Ophüls, it facilitates viewers in engaging with ideas and issues that most other filmmakers fail to address. And like the Ophüls film it is both analytical and dramatic. If the two filmmakers’ conversation is fascinating it is also extremely entertaining. Both are able to offer subtle phrasings and sly digs. Ophüls make good use of the term ‘establishment’ at Godard’s expense. Both are extremely witty. There is great humour in Ophüls description of his endless faxes to Godard. Godard’s strong points, as one would expect, concern being precise about what tends to be called ‘film theory’. He makes the point about how all the words and sentences about the ‘auteur’ tend to forget about the importance in the original articles of the word ‘politique’. And he, like his companion, pays tribute to their mutual friend François Truffaut. My only concern with the film was with the translation of the sub-titles. At one point Godard refers to a metteur en scène, which is translated as ‘director’. Whereas, of course, this is an important term in the continuing debates about where authorship resides. What this film does demonstrate is that both these filmmakers are ‘auteurs’ in the original sense of the articles in Cahiers du Cinèma, in that they bring a personal vision to their films, but importantly this is a vision that is analytical and political. This entry was posted on May 4, 2012 at 1:18 pm	and is filed under auteurs, Festivals. You can follow any responses to this entry through the RSS 2.0 feed. You can leave a response, or trackback from your own site. Nice article! Just one point – Max Ophüls was Jewish, but he married a Catholic. So Marcel has pointed out in the past that he is a Catholic. And of course, the Ophüls family fled to Switzerland in 1940 and left for Hollywood in 1941. Marcel actually went to Hollywood High School and UC Berkeley!